FIR Designer 2.4 now integrates with Powersoft amplifiers. Transfer a DSP signal chain directly from FIR Designer to Armonía for use in Powersoft amplifiers via our new DTP (Direct-To-Processor) functionality. Pre-existing FIR filters (from sources other than FIR Designer) can also be loaded – with or without resampling – and transferred in combination with FIR Designer’s IIRs, gain, delay and polarity settings. DTP for Powersoft works via an XML file which can be loaded into the “Speaker EQ” or “Output EQ” on X, Ottocanali, Quattrocanali and DueCanali series amplifiers. Powersoft is the second brand to offer close integration with FIR Designer (LabGruppen LAKE PLM, PLM+ & D series amplifier integration was released in FIRd v2.3). We’re hoping to provide direct integration with other amp/processor brands in the near future. 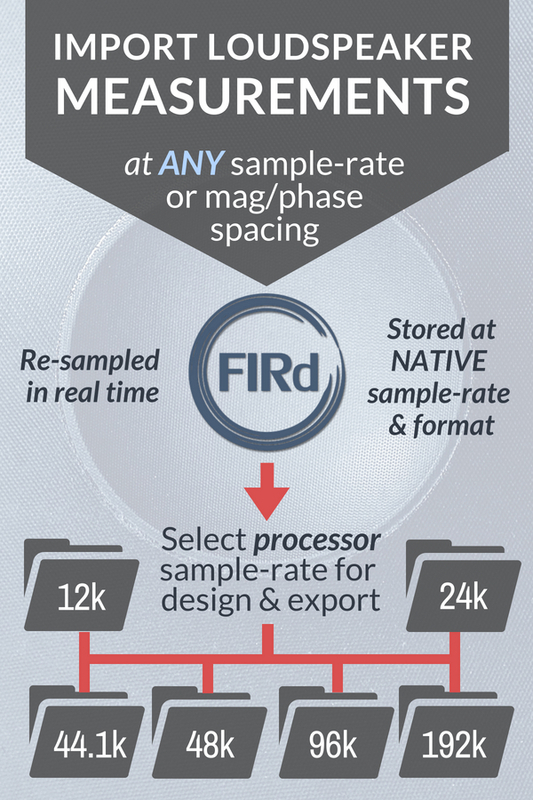 In the meantime, FIR Designer can export data in a variety of formats for subsequent upload into most FIR-capable productsWe’d love your feedback: Which amplifier brands would you most like to see facilitating direct-to-processor FIR Filters/DSP chains from FIR Designer? Tell us here. For more details on v2.4, see the Release Notes. Learn more about FIR Designer or download a free demo (Windows or Mac). Existing FIR Designer 1 license-holders are eligible for a USD $100 coupon towards the first-year purchase of FIR Designer 2.4; just contact us. FIR Designer now integrates with LAKE PLM & D series amplifiers. Push a complete DSP signal chain directly from FIR Designer to the LAKE FIR 3-way module via our new DTP (Direct-To-Processor) functionality. Watch the video here. Pre-existing FIR filters (from sources other than FIR Designer) can also be pushed – with or without resampling – in combination with FIR Designer’s IIRs, gain, delay and polarity settings. DTP works locally – over either a fixed network or WiFi – with a new LAKE Controller plugin (supplied in the FIR Designer 2.3.0 Windows installer). Data transfer takes only a few clicks. We’re hoping to provide direct integration with other amp/processor brands in the near future. In the meantime, FIR Designer can export data in a variety of formats for subsequent upload into most FIR-capable products. We’d love your feedback: Which amplifier brands would you most like to see facilitating direct-to-processor FIR Filters/DSP chains from FIR Designer? Tell us here. For more details on v2.3, see the Release Notes. Existing FIR Designer 1 license-holders are eligible for a USD $100 coupon towards the first-year purchase of FIR Designer 2.2; just contact us. FIR filtering offers advantages over traditional IIR all-pass filters when flattening the phase of a loudspeaker or shaping the phase to match others in an installation. IIR filters have a negative phase gradient & only provide time delay with increasing frequency. However, FIR filtering can implement phase responses with both positive & negative gradients, providing arbitrary phase/time shaping of a loudspeaker response. FIR Designer offers traditional 1st & 2nd order minimum-phase all-pass filter prototypes, plus maximum-phase (inverted phase) versions & a unique 4th order parametric phase filter with a range of ±90 degrees, adjustable BW & frequency. An unlimited number of prototypes can be used to create the combined FIR filter phase response. Use either FIR Designer or FIR Creator EX to create a complete loudspeaker preset, with the Gain/Polarity/Delay options now available in the filter creation workflow. On the ‘Export’ tab, save the gain, polarity, delay and IIR filters in a new Summary file, which – in combination with the FIR filter file – contain everything needed for a complete DSP channel signal chain. Use a single chain for filtering a full bandwidth loudspeaker, or create multiple DSP channel signal chains to make multi-way loudspeaker presets. FIR Designer, Creator & Creator EX store the imported loudspeaker measurement in its “native” sample rate (or mag/phase format) so no information is lost during import. Whenever the FIR filter design sample rate is changed, as when exporting a filter for a processor with a different sample rate, the original measurement is resampled to the FIR filter design sample rate. See a list of FIR-capable products (amplifiers & speaker processors). See supported file formats for measurement import. Unlike common Linkwitz-Riley filters, many other high & low-pass IIR &/or FIR crossover filters don’t sum to unity or have matched phase. For a perfectly flat summed response, FIR Designer can calculate a COMPLEMENTARY HP (or LP) filter from the chosen LP (or HP) filter, when set to linear-phase. Combine up to 200 imported speaker measurements into a single average measurement, to use as an input into FIR Designer’s filter design workflow. This newly-released tutorial video demonstrates how to use FIR Designer for loudpeaker measurement averaging. Update August 2018: Check out the stand-alone Averager application. Smaart Trace (TRF) files with a specific FFT size can now be loaded into FIR Designer or FIR Creator (previously only MTW based Trace files were accepted). V2 license holders: check your email for a link to download the latest version. (BTW, FIR Designer 1.31.7 includes same update). In response to feedback – especially from MiniDSP users – FIR Creator v1.1 now includes a 96 kHz sample rate option (in addition to 44.1 & 48). Full specs at www.eclipseaudio.com/fir-creator. FIR Creator 1.1 also includes new accelerated FFT’s, which are roughly 4x faster than the FFT’s in the original version 1. Every UI change triggers many 10’s of double-precision transforms so these updates translate into faster screen refreshing during filter design (the latest version of FIR Designer also includes this speed improvement). See a time/frequency map of the loudspeaker impulse response, with or without filtering. Updates in real time due to a unique, efficient implementation; instantly see the impact of changes made elsewhere in the workflow. Includes adjustable wavelet width & view scaling. Existing FIR Designer 1 license-holders are eligible for a USD $100 coupon towards the first-year purchase of FIR Designer 2; just contact us.